Tomos Parry had an unusual route into cheffing, via a degree in politics and history. He worked in Cardiff then London, where he secured a role at The River Café. After that came a stage at Noma where he met James Knappett, going on to help him open Kitchen Table at Bubbledogs. At Climpson’s Arch, a space under the railway in Hackney, Parry was able to develop his skill with a wood-fire grill. Parry’s stretch as head chef at The Arch saw him win Young British Foodie in 2014. 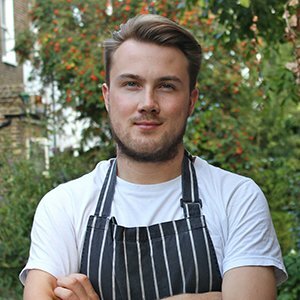 He was the Head Chef at Kitty Fisher’s in Mayfair, which won Best Restaurant at the GQ Awards in 2015, and opened BRAT to critical acclaim in 2018.